In a cultural landscape where people with short attention spans have too much media to consume, word of mouth and first impressions are more important than ever for independent art. For video games, catching eyes with a visual style in a news cycle where games are shown off seconds at a time in trailer montages and Nintendo Directs is key. With that, The World Next Door for Switch and PC is one of those games that caught my eye. To just describe the visual art style as “anime-inspired” would be underselling it. This game from developer Rose City Games flaunts a bright color scheme, fantastic character designs, and an intriguing premise to match it. With a fresh tile-matching battle system and a fascinating magical parallel world, I found myself entranced. And then, with little warning, the game abruptly ended—my time in this lovely world next door was cut short. The titular “world next door” is called Emrys, a world full of mystical creatures and one where magic is possible. Emrys is parallel to our Earth, and as the two worlds are aware of each other, a lottery allows chosen inhabitants from Earth to visit Emrys, and vice versa. Enter Jun, a mask and crop top-donning rebellious teen girl from Earth who fantasizes bout Emrys culture and is lucky enough to be drawn from the lottery for this special occasion. Jun finds herself amongst a posse of magical friends, namely her online friend Liza. When her new friends take her to a shrine to give her some tips on magic use, a peculiar set of events leaves her stranded in this other world with a ticking clock—too much time on this other world will end with her demise. 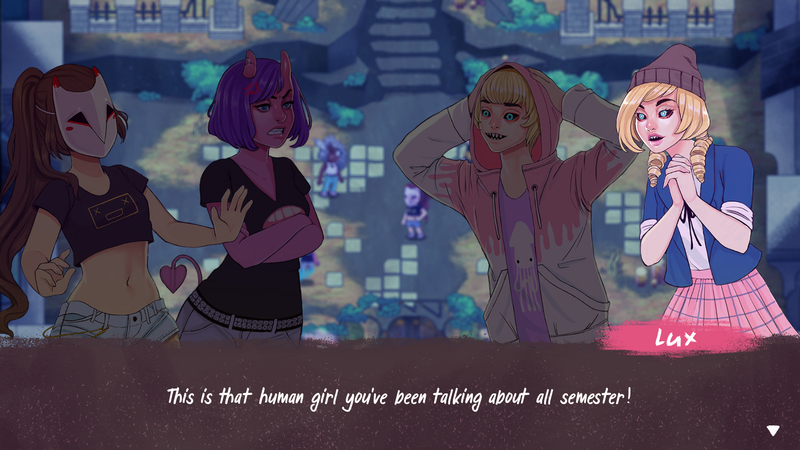 Scenes are presented in the style of a visual novel, with text cards and limited voice acting—characters may make grunts and other assorted noises, but characters speak in gibberish phrases (or Emrys phrases, probably). 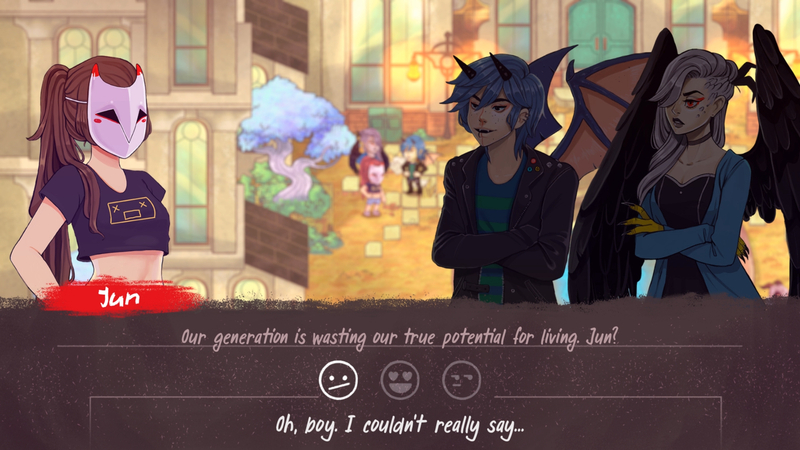 Players will be able to choose between dialogue options for Jun, though they do little other than present different sides of Jun’s personality. The colorful overworld has the characters in chibi-like form, where players control Jun in talking with NPCs and fight enemies in combat. 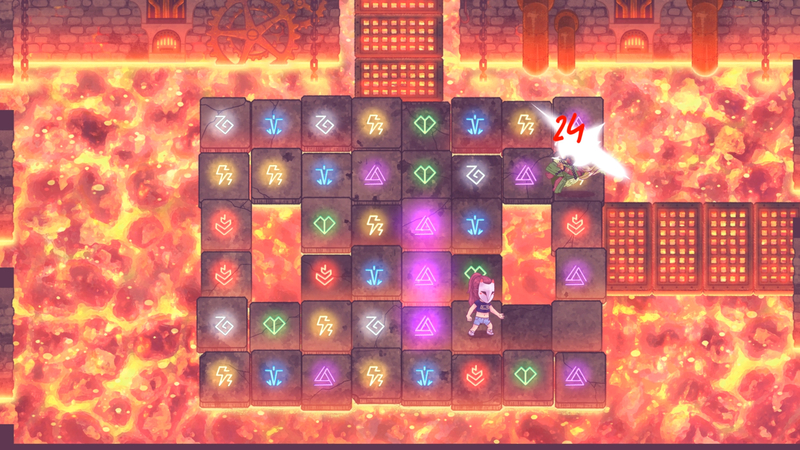 The real-time battle system of The World Next Door resembles a match-3 puzzle game, with the player having to switch tiles, or runes, until at least three of them are adjacent from each other. Jun can then activate the runes for an attack, with each kind of rune providing a different effect. Red provides a fireball, blue a slashing attack, yellow activates an electrical field, purple a slow-moving “void” ball, and green heals Jun. It won’t take long until you can think of strategies to concoct—for example, setting up healing runes for use later, or having multiple sets of runes adjacent to each other. Doing so will amplify their power. Additionally, Jun can organize white runes into patterns to summon her friends for attacks. The player will have to choose between characters like the meek Rainy to create a defensive shield or the hot-headed Horace to whip up a massive fireball. Enemies roam around every few rooms in the dungeon-like shrines. Monsters will slash at Jun, though the player has a dodge-dash mechanic as their lone defensive option. Some monsters will make use of the runes themselves, using your own weapons against you. At times, it feels as if certain luck of the draw or particular rune arrangements will lead to either a swift and easy victory or an impossible gridlock. While there are difficult enemy encounters, bosses will take some time but, unfortunately, little effort. One thing is for certain: the character designs are amazing. The denizens of Emrys all have distinct physical characteristics, and while they all have human-like proportions, these diverse characters carry features of mythical creatures and animals. There’s the devil-like Liza, with her horns and tail, the undead Horace, the mermaid-like Rainy, and a host of many other cool characters. Then you have minor NPCs like the water nymph Camelia and the rock monster King, who houses a bird on his head. A character named Cornell, with a third eye some sort of spiritual orb in his head, stood out to me in particular. All of these characters wear contemporary clothing, and they all embody a classic archetype from your typical school or university story. There’s the jock, the rebel, the goth, the wallflower, the bookworm, and so on and so forth. Some may find it derivative, but it helped give Emrys a bit more of a grounded feeling. After all, this is a parallel world and not some sort of medieval Middle-Earth or Westeros-type deal. Enemies are equally as beautiful, but there is not much variety in enemies or environments. All of the shrines you visit have indistinguishable layouts with a slightly different backdrop. Think water shrine, fire shrine, etc. In fact, the “final” shrine was just a revisit of the first. What kept the artistic element of the game fresh to me was the excellent soundtrack. With its use of percussion and piano, I found many of the musical pieces and battle music stuck in my head for days. It’s a shame that it feels like there was nothing to do around in Emrys. The overworld is limited, and despite verbal mentions of places like an arcade and a university, you really only get to walk around four screens outside of a dormitory. Sidequests from characters may pop up, but they usually involve finding something in another screen or doing puzzles or combat practice in an already visited shrine. There seems to be an illusion of content in The World Next Door—the cellphone-like menu has icons for “quests,” but these are quite light, as mentioned. There’s an inventory of objects or items that Jun has collected, but they do absolutely nothing—they’re just there for show. Jun even has a “Weird Sword,” but it is only used in cutscenes at the end of boss battles, or used to open doors. For two to three hours, I kept hoping that the game would open up. But before I knew it, the game was over. Various plot lines, including one about kidnapped friends and another about the mysterious forces that kept Jun in Emrys, were dropped. What I thought would be the end of a story act was actually the end of the game, something that didn’t register to me until the credits began rolling. I kept expecting some sort of post-credits scene hinting at a sequel, or at least another comic tie-in (a prelude comic told the story of Jun’s arrival), but my copy of the game actually froze and booted me back into the menu screen mid-credits. If I were to hit “Continue,” I would be taken back to the final cutscene, with no option of going back to the world to finish a few missed sidequests—I hope that this is a cruel glitch and not by design. With all of the magnificent world-building, I couldn’t help but be immensely disappointed by the lack of catharsis, or any closure with character development or plot. Like Jun, I wanted to bask in the world of Emrys for even longer. I certainly hope that the developers and artists expand the world with a bigger sequel. Right now, The World Next Door sits in my Switch menu—I smile at its icon, but I will likely never open it again.